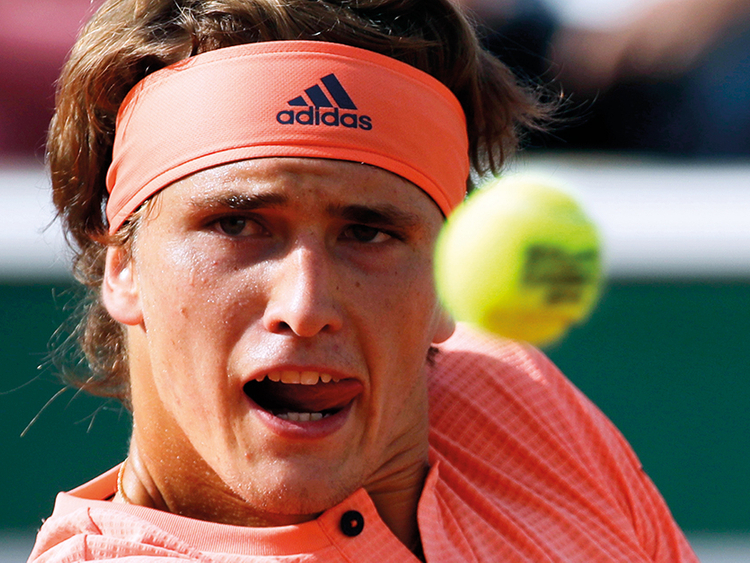 Paris: German second seed Alexander Zverev saved a match point and survived a second successive French Open scare on Friday, coming back to defeat Bosnia’s Damir Dzumhur in five sets to reach the fourth round for the first time. World No. 29 Dzumhur also served for the match in the fourth set, but Zverev clung on and battled to a 6-2, 3-6, 4-6, 7-6, 7-5 victory. Zverev, 21, who is seen as the main threat to Rafael Nadal’s expected coronation as champion for an 11th time, endured a nightmare outing on Court Philippe Chatrier before claiming victory after almost four hours of play. He had to save a match point in the 10th game of the decider before breaking and holding to make the last 16 for the first time. “It was an amazing, high level match,” said Zverev. Fourth seed Dimitrov was knocked out by Fernando Verdasco, with the Spaniard winning 7-6, 6-2, 6-4 in his 350th clay-court match. “You have to draw the line and, you know, look for the next chapter,” said the world No. 5. Eyeing his first quarter-final appearance at the French Open, Verdasco now has a daunting task ahead of him in the shape of Novak Djokovic. The former champion claimed a hard fought 6-4, 6-7, 7-6, 6-2 victory over Roberto Bautista Agut to book his spot in the fourth round. The 31-year-old former world No. 1 struggled at times on Suzanne Lenglen court, but eventually came through the four-set battle in three hours and 48 minutes. Djokovic has now made the last 16 of a Slam for the 43rd time, tying Jimmy Connors on the all-time list. Japan’s Kei Nishikori made short work of home hope Gilles Simon as he cruised into the fourth round for the fifth time. The 28-year-old, seeded 19 in his first Grand Slam since Wimbledon last year after struggling with a wrist injury, saw off Simon 6-3, 6-1, 6-3. In the women’s draw, US Open runner-up Madison Keys beat Japanese 21st seed Naomi Osaka 6-1, 7-6. The 13th seed missed a match point on her own serve in the second set, but then saved two set points in a tie-break before an Osaka double fault sent the American through to a last-16 tie with 31st seed Mihaela Buzarnescu. Buzarnescu, a 30-year-old Romanian who had never won a Grand Slam match before this week, downed fourth seed Elina Svitolina with a shock 6-3, 7-5 victory. Russian youngster Daria Kasatkina overcame a second-set blip to see off Maria Sakkari 6-1, 1-6, 6-3, while Kazakhstan’s Yulia Putintseva, a quarter-finalist in 2016, beat China’s Wang Qiang 1-6, 7-5, 6-4. French favourite Richard Gasquet says he has to “find the solutions” to finally beat old junior rival Nadal at Roland Garros on Saturday after losing all 15 of their Tour-level matches. Gasquet’s miserable head-to-head record against his childhood friend has shown no signs of improving in recent years — the world number 32 has not taken a set off the Spaniard since 2008. The 27th seed insisted he doesn’t respect Nadal too much on court, though, pointing out that he’s not the first man to struggle against the 10-time French Open champion. “It’s not a question of respect. When I’m on the court, I lose. That’s it. I do my best every time,” he said. The pair will meet for a 16th time with Gasquet looking to end Nadal’s bid for an 11th French Open title in the third round. “It’s up to me to find the solutions,” said Gasquet after his 6-2, 3-6, 6-3, 6-0 second-round victory over Malek Jaziri. Nadal thrashed Argentinian Guido Pella 6-2, 6-1, 6-1 to reach the last 32. Fernando Verdasco (30) def. Grigor Dimitrov (4) 7-6, 6-2, 6-4. Kei Nishikori (19) def. Gilles Simon 6-3, 6-1, 6-3. Alexander Zverev (2) def. Damir Dzumhur (26) 6-2, 3-6, 4-6, 7-6 (3), 7-5. Barbora Strycova (26) def. Katerina Siniakova 6-2, 6-3. Yulia Putintseva def. Qiang Wang, China, 1-6, 7-5, 6-4. Madison Keys (13) def. Naomi Osaka (21) 6-1, 7-6 (7). Mihaela Buzarnescu (31) def. Elina Svitolina (4) 6-3, 7-5. Daria Kasatkina (14) def. Maria Sakkari 6-1, 1-6, 6-3.